Jersey City History - Old Bergen - Chapter LII. TRADITION relates a sorrowful romance in connection with Castle Point. It is said that on the return of Hudson from his explorations up the Hudson, lured by the beauty of the spot, he determined to land and make closer acquaintance with its attractions. Accordingly he cast anchor in Weehawken Bay, and as his vessel was at once surrounded by Indians in their canoes, he made them understand by signs that on the morrow he would visit their chiefs. Whereupon they departed, and commenced great preparations for the reception of the white strangers. The chiefs arrayed themselves in glossy skins, ornamented with feathers and rare-colored shells, while the women of the tribe were dressed in all their finery, which consisted for the most part of highly colored pliable mats or blankets, made from the finest of rushes, and shell necklaces. Hudson and his crew donned their brightest uniforms, and with well polished weapons, presented a goodly array as they disembarked from their vessel. Great curiosity was manifested by all the Indian women, while the braves, although evidently impressed by the gallant bearing of their visitors, preserved that stolid, indifferent demeanor for which the savage has ever been noted. After a formal welcome by the chiefs, and a judicious distribution of presents by Hudson, the pipe was passed from mouth to mouth and formality dispensed with. Among the party of Hudson was a young gallant, formerly attached to the English court, but who, influenced by his love of adventure, had cast in his lot with the discoverers. He was conspicuous by reason of his great stature and comely appearance, and rioting in the daughter of the chief, who was eyeing him furtively, a person of uncommon grace and beauty, he determined to ply the arts that had been so successful at court, and enliven the time by a flirtation with this forest beauty. He contrived to make her understand what great havoc she had created with his affections, and soon they were familiarly conversing with signs, which were interpreted the more easily through that innate sympathy which is common alike to the maiden of the forest and the belle of the drawing-room. They wandered away through the forest shades, and soon reached a secluded spot on the shore, where they sat down side by side on a fallen log, she reclining lightly against his shoulder. But in spite of the peaceful surroundings, the scene was soon to be changed. One of the warriors, who had long wooed the Indian maiden, and was only waiting to secure sufficient wealth to exchange for her with her father-the old chief-had watched the advances of the bold gallant with a jealous eye, and stealthily followed them through the forest's depths. His savage nature could not calmly submit to be thus thrust aside for this bold stranger, and as he noted the caresses with which the latter punctuated his sign language, he became inflamed with hate, and several times raised his bow in readiness to send on its mission the deadly arrow, but as often relaxed his effort. But when he saw the maiden almost reclining in the embrace of the stranger, his anger became so fierce, that, maddened beyond restraint, he drew the bow to its utmost tension, and let fly the fatal arrow with so sure an aim that it not only pierced the body of the maiden, but inflicted a mortal wound oil the gallant. With features convulsed with jealous anger and rage, he rushed forward to find the maiden's lifeblood gushing forth in streams, and her suitor with agony depicted on his features, endeavoring to stanch the wound in his own breast. Seeing the approach of the savage, he gaspingly pleaded for his life, but of no avail. With demoniacal laughter the crushing blow descended, and man and maiden both lay in the embrace of death at the feet of the infuriated savage. Suddenly seizing the body of the maiden, he bore it on his shoulders, and laid it at the feet of the old chieftain, indicating that her death was caused by the white men whom he was then entertaining. The fiery, untamed nature of the savage burst forth, and threatening glances were cast upon Hudson and his men. They soon saw that instant flight alone could save their lives from the now thoroughly aroused Indians, and an immediate retreat was ordered. The savages pressed them closely, but by keeping in close array, with blunderbusses ready for action, they were able to reach their boats in safety, and were soon pulled to their vessel. They here missed their companion, but as the shades of night were drawing on, determined that nothing could be done until morning. At the early dawn of the following day the shrill warwhoop of the Indians was heard, and on looking forth, their uncertainty as to the young man's fate was dispelled, for, circling the vessel in his bark canoe was a savage in full war-paint, brandishing the yellow scalp lock of their companion. So threatening did the aspect of the Indians become, that Hudson immediately weighed anchor and departed from so dangerous a neighborhood. 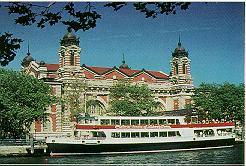 For over twenty years Hoboken was the home of the New York Yacht Club, which was founded in 1844 by John C. Stevens. The first meeting was held on board his schooner yacht, the Gimcrack. In response to his invitation, nine gentlemen appeared and organized what is now one of the most celebrated yacht clubs in the world. In 1845, the first club house was built in the "Elysian Fields," and this continued to be the club's home until 1868, when its headquarters was transferred to Staten Island. In the early days Hoboken was, like its neighboring city, at times surrounded by water, the high ground terminating at Castle Point forming an island. An old description states: " Hoboken is an island, the westerly side of which is one-half mile from the New Jersey Shore." This space has since been filled in by natural and artificial means, so that the old creek and marshes by which it was surrounded have almost catirely disappeared. Above Weehawken and just south of the West shore ferry landing, is the site of the famous duelling ground, specially noted as the spot where the lamented and scholarly Hamilton met his untimely end at the hands of the polished and courtly, yet infamous Burr. About twenty feet above the surface of the Ni ater that laves the foot of the overhanging cliffs was a small grassy plateau, about sixty by one hundred feet in area, completely shut off from the surrounding country by perpendicular cliffs reaching up on the sides and back. These in summer were covered with a profusion of vines and mosses, and with the broad river below glittering in quiet ripples, and a rampart of cedar and other bushes at the edge that screened it from the gaze of any casual passer by, it was a spot of unusual beauty, suggesting a peace and quietness, utterly at variance with the bloody deeds there enacted. And yet its very retirement, rendering it safe from unwelcome intrusion and difficult of access, it being reached only by a rough narrow path from the water, made it a resort for the vengeful and lawless. A long list might be published of those who carne to this spot, determined to settle their differences according to the so called " Code of Honor; " but none was so universally regretted as the unfortunate Hamilton, who in a moment of weakness, allowed himself to be come the victim of vindictive passions. The march of improvements, necessitating the cutting away of the river bank for railroad purposes, has completely obliterated the spot, but the monument erected thereon to commemorate the place, was moved to the top of the bluff directly back of its original location. That your memoralist hath constructed a boat to be propelled by horses, or mules, which he contemplates to use on the ferry from the foot of Vesey Street to Hoboken, which he hopes will prove a substitute for a steamboat. This boat seems to have been constructed on a somewhat different plan from those in use on the Paulus Hook ferry. It had a circular platform in the center, with cleats to give the horses foothold, and the shaft of the paddlewheel was made to revolve by means of cranks on a small wheel on either side of the shaft, geared to a large wheel, on an upright spindle like a crab or cider mill, with two or four arms extending over the platform, and to these arms two, four or eight horses or mules were hitched. The dimensions of this boat were: length, 100 feet; width, 12 feet; depth, 7 feet.